1 What is the MOOD BOOST? 2 Keep this in mind! What is the MOOD BOOST? 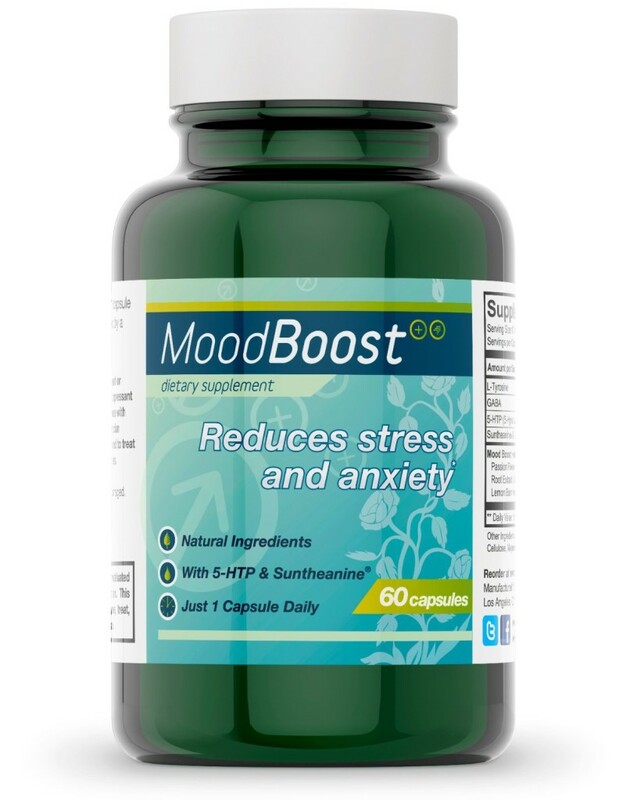 Mood Boost is a natural dietary supplement, which helps in reducing of the stress and anxiety. It is meant to be taken on a daily basis: one capsule taken once or twice per day, as it is written on directions. Suggested time of usage is bedtime. One packaging contains 60 capsules. It is possible to feel positive effects of the Mood Boost even the first day of use, but the seller recommends taking of the supplement for 2 weeks before noticing full effects of it. They also claim that you will not feel after taste, like on some other supplements, and it does not cause gas or belching. Capsules are vegetarian and contain amino acids and herbs that are already proven to help in stress and anxiety relief. In the info bar and on the packaging all the ingredients are listed. It is important to go through them in order to avoid any negative effects if your organism is allergic to any. Ingredients are: L-Tyrosine, GABA, 5-HTP (5-Hydroxy L-Tryptophan), Suntheanine L-Theanine, Ashwagandha Root Extract, Passion Flower Extract, Rhodiola Rosea Extract, Chamomile Extract, and Lemon Balm Extract. Other Ingredients: Vegetable Capsule, Microcrystalline Cellulose, Magnesium Stearate, Silicon Dioxide. While taking those pills, keep in mind following: they should be kept out of reach of any children, just like for any other medication, supplement etc. Also, if you are pregnant or lactating women, taking anti-depressant medication (SSRI’s or MAOI’s), or having liver disorders, please consult a physician before taking Mood Boost. Another thing important mentioning is that Mood Boost won’t help you in treating of the clinical depression or anxiety disorders. It is possible that actual product packaging and materials contain more/different information than those shown on the website. Therefore, it is recommend not to rely completely on the information presented on the website. The best thing to do is to always read labels, warnings, and directions before using or consuming a product. Most of the comments of buyers and users are positive. Generally, people are satisfied with the product as it does its job very well. It helps in feeling calm and distressed. In addition, it helps in falling asleep, as many people do suffer this kind of problem along with stress and anxiety. However, some negative effects are not impossible to occur. For example, it happened for one elder woman to feel terrible headache after the usage. Still, she claimed that it helps in stress and anxiety relief, but obviously her organism does not tolerate the pill so good. Furthermore, it is possible that Mood Boost doesn’t help you at all – it can be simply too weak for you. Or, it can sometimes make you feel dizzy or giddy after usage – that means it is possibly too strong for you and your body. So, keep in mind all of this while purchasing and using of the Mood Boost. If you do feel any side effect (or do not feel effects at all) it is better to stop using it. Seller gives a 60-day money back guarantee, so feel free to ask for it after making sure that it does not help you or that your body doesn’t feel like accepting the supplement. Seller also points out that if you’re unable to receive your refund through Amazon, you should contact them directly. As for now, every refund went good and everyone’s wish was satisfied. After all of the written, we can only let you to decide on your own. There are so many positive comments on the product, so it could definitely help you. On the other hand, it is not impossible for the side effect to occur. But, that could happen with any medication and, as for Mood Boost, you can always stop using it and ask for the refund. We wish you good luck with relieving the stress and anxiety and feel free to write us your comment if you decide on trying the Mood Boost.